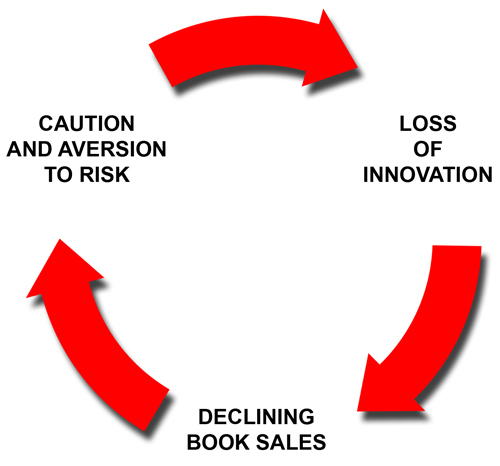 Over the past several years, the major publishing houses have seen a downward trend in book sales. Doomsayers in the industry attribute the falloff to a general decline in reading. They flatly state that American consumers are not buying books, and that the public has lost its taste for the written word. An examination of recent sales figures shows that this notion is false. In fact, the overall number of book purchases has been increasing, but the majority of those sales are now going to independent authors/publishers. When book sales decline, publishers become understandably anxious. They begin to avoid risk, and seek “safe” solutions that have worked well in the past. Rather than gambling on unknown authors or new approaches to storytelling, editors tend to invest in established (i.e. famous) writers, and familiar story formulae that have proven effective in previously published books. They attempt to duplicate past successes. (Which probably explains how James Patterson ended up with his famous 17 book/$150 million deal with Hachette Book Group.) In most cases, the ultimate result is neither new, nor exciting. Readers are not stupid. They’re quite capable of recognizing the same old stuff when they see it, and they demonstrate their dissatisfaction by spending their money elsewhere. This leads to a further decline in book sales, which (in turn) leads to even greater anxiety in the publishing industry. And the cycle repeats itself. Stealth Books® is not bound by the Circle of Fear. We never assume that what we did yesterday should be accepted as the template for what we do tomorrow. We’re not afraid to take risks in order to bring our readers something new. In fact, our imprint was founded for that very purpose.